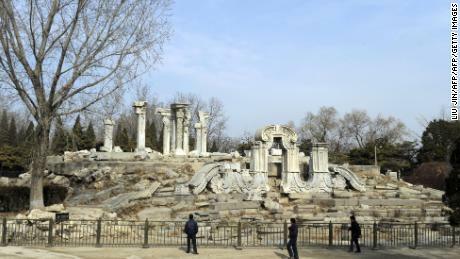 French and British troops burned the Summer Palace to the ground during the Second Opium War in 1860 and it has since become a key element in the “Century of Humiliation” narrative taught in Chinese schools. During the 19th century, foreign powers, chief among them the UK, invaded the Qing Empire and imposed unfair treaties on it after defeat, seizing Hong Kong and forcing open various “treaty ports,” such as Shanghai, to foreign trade. While the overwhelming reaction in China to Monday’s fire was one of sympathy and shock, some could not help but point what they saw as historical parallels, even a bit of justice. A “Summer Palace” hashtag on Chinese social platform Weibo attracted close to 100 million views, with many comments about karma or the importance of remembering China’s own experience. Built in the 1700s on the outskirts of Beijing, the 350-hectare (864 acres) Summer Palace was a secondary residence and capital for the Qing emperors away from the Forbidden City. It was particularly favored by the Xianfeng Emperor, who spent much of his time there in the lead up to the Second Opium War, when a British and French force marched towards Beijing to put pressure on the closed-off Qing Empire to expand foreign trading rights. Envoys met with Qing officials, but after talks broke down they were seized and held hostage. Furious, the UK’s Lord Elgin ordered his forces to advance on Beijing. Instead, they found it empty and swiftly set to looting the place. Outgunned by the foreigners, the Qing released the negotiators, who told of how they had been subjected to torture, abuse and constant threats of execution. Of 26 men seized by the Qing, 15 had died during captivity, including a reporter for the London Times. Elgin was determined to punish the Qing for their mistreatment of hostages. But he was also keen for the UK not be seen to be taking action against the Chinese people — only their rulers. And so he instructed the British army to burn the Summer Palace to the ground. 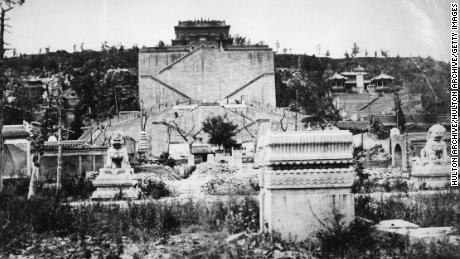 The burning of the Summer Palace has become an indelible image for the sufferings of China during the colonial period. This inspired numerous comments on social media that the fire at Notre Dame was a form of karmic justice. For many young Chinese, another link between the burning of the Summer Palace and the fire at Notre Dame exists through the words of Victor Hugo, whose comments on the destruction of imperial garden feature in numerous Chinese textbooks. A quote of his is also engraved under a bust of the writer at the site of the palace in Beijing. Hugo, whose novel “The Hunchback of Notre Dame” helped spark renewed interest and a restoration of the old cathedral in 1830, was one of more high-profile Europeans utterly appalled by the actions of their army in China. CNN’s Serenitie Wang contributed reporting.